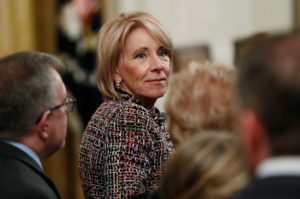 WASHINGTON — Education Secretary Betsy DeVos says ballooning student debt has caused a crisis in higher education and that the traditional path to college might not be the best choice for everyone. Speaking at a conference in Atlanta on Tuesday, DeVos raised a “red warning flag” that the federal government must change the way it gives out student loans. She says the federal government holds nearly $1.5 trillion in outstanding student loans, up from $500 billion in 2007. DeVos says the Obama administration worsened the problem by taking over the administration of student loans in 2010. She says that encouraged schools to raise rates. DeVos didn’t propose specific changes but said students should be encouraged to take the path “that’s right for them,” even if it isn’t toward a traditional college.